Our product Magigoo, the smart adhesive for the first layer bed adhesion in FFF 3D printing was released as a beta in late 2015. Since then the product went through multiple iterations and reached maturity, becoming one of the standards in bed adhesion solutions. The most loved and distinctive features of Magigoo is its easy release and chemically safe formulation. Even though the product was developed and is produced by a Maltese start-up company on a small Mediterranean island, it is now available in 20 countries on three continents. Today the product has a wide range of users including educators, hobbyists, makers and professionals both private individuals as well as very established international companies. To learn a bit more about our customer profiles, we went out on a quest to gather a number of case studies. Tell us more about gCreate ? 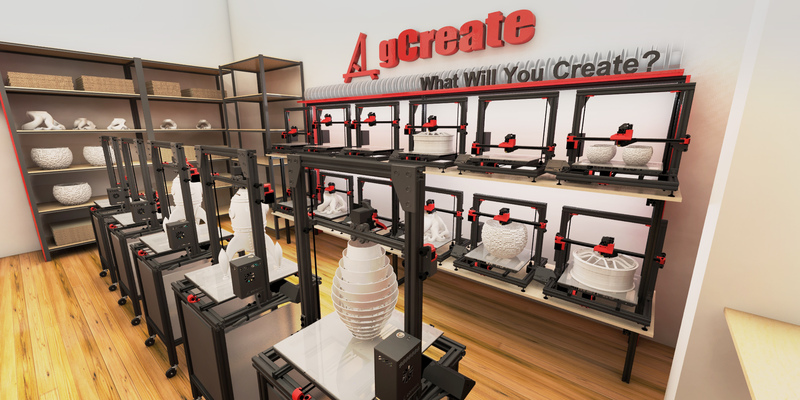 The founders of gCreate (Gordon LaPlante and Anna Lee) launched a Kickstarter back in 2013 with a goal of $50K to produce the first "gMax 1.0" Large format 3D Printer. The Kickstarter was an overwhelming success, supported by 150 backers and generating about $130K despite each reward level being capped with limited quantities. It's also worth mentioning that the decision to cap each reward tier allowed us to fulfill all of our Kickstarter obligations within 6 months. How do you use 3D printing? To handle the volume of printed parts needed for the growing numbers of printers we were selling, we continued to add in-house gMax printers to our print farm. This lead to the creation of the print service division of gCreate. We utilize 3D printing service sites such as 3D Hubs as well as independently provide 3D printing services direct to the customer. Our current print farm consists of over a dozen gMax 1.5XT+ (16"x16"x21") printers and is easily scalable. We also have one custom made ultra wide gMax with a massive build volume of 42"x17"x21" that we call the gMax BIG. What filaments do you use? We experiment with many different kinds of filament here at gCreate, everything from PLA and ABS to Polycarbonate Carbon Fiber Composite. We do the research on these filaments to help improve our printers and grow our knowledge database, as well as give our customers as many options as we can and ensure we have the right material for the part they need. How do you use Magigoo? We use Magigoo on our glass heated bed system and it works out great! We have no tolerance for bad bed adhesion, something like the 3DX Tech Carbon fiber Polycarbonate costs upwards of $150/kg so having a print fail could be a very expensive loss. Not only do we lose out on the filament wasted in the failed print but since we are a large format print farm our prints will often go for days at a time. Having a print fail because of bad bed adhesion 1 to 2 days it is a major loss and a huge waste of time and money while affecting our turnaround time for our customers. We have been very happy with how Magigoo has changed our 3D Printing workflow and reduced our failure rate. What trends do you see in 3D printing? There is no question that 3D printing is the future and we are so happy to be a part of that! Just within the past few years, the technology within the 3D printing industry has grown immensely, making it a much more viable option for manufacturing. This is why we are continuing to develop high-quality 3D printers and grow our 3D print service offerings to increasingly provide great affordable options for small-scale manufacturing and rapid prototyping. Wide range, reliable 3D printing is always a priority, we want to make sure our printers are the best option for commercial and enthusiasts alike!